Jamie has been watching the wee white seal that lives on the beach. At night the wee seal cuddles up to its mother. In the morning she goes out to sea and leaves it alone like a strange white stone on the sand. 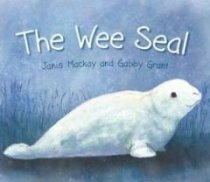 One day tourists come and crowd the wee seal but Jamie knows just what to do to protect it until its mother comes back...Janis Mackay's lyrical prose tells the story of the tender relationship between the wild baby seal and the young boy who watches over it, while Gabby Grant's soft illustrations brilliantly evoke the landscape of the Orkney Islands.